RevoNext QT3 review | What Hi-Fi? The RevoNext QT3s are a strange product. They float around on online retail sites in a sea of earphones from companies most people will never have heard of, but they offer hardware usually only seen in pairs many times the price. For example, Shure’s quad-driver SE846 earphones cost £869, while RevoNext offers the same headline features for £50. That almost sounds too good to be true – and, inevitably, it is. RevoNext has worked hard to ensure the QT3s have high-end looks to match the high-end specs. The cabling is smoky and translucent, with the shells made of aluminium, from the tip of the aperture to the cable terminal. Look closely and you’ll see it’s a fairly simple construction. The back of each earpiece is a separate block of metal, with a lid held in place by three tiny Torx screws. RevoNext has embraced the industrial look these give the QT3, adding stark embossed parts to this lid. The cable is removable too. It uses a system similar to that of older high-end earphones, such as the Ultimate Ears Triple.Fi Pro 10, with two prongs sitting at the end of the cable. Be careful, though – there’s no click, just a prolonged tug that leaves you hoping the QT3s’ rather long contacts won’t bend. There are problems with the design of other parts of the RevoNext QT3 too. Any moisture in your ear, such as from sweat or taking a shower, and the disc that sits over the earphone aperture, or the filter system behind it, becomes blocked. When this happens, the sound suddenly becomes veiled and small, as if the drivers have suddenly died, or as if playing behind cardboard. Drying the aperture with kitchen roll doesn’t fix this, and while the QT3s always seem to come back to life after a period of recuperation, it shows a collection of parts that appears to be ‘high-end’ does not constitute smart design. 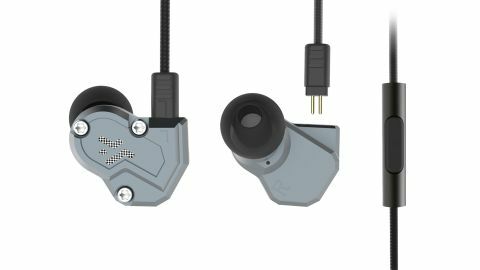 The cable has a one-button remote housing for low-fuss compatibility across Android and iOS, and the over-ear fit helps minimise microphone noise. But the cable style mostly hides the fact that the QT3s aren’t a high-end pair of headphones, which to its credit, it does fairly successfully. However, the illusion of a high-end product is soon shattered by the sound quality. On paper, the RevoNext QT3s should sound ‘right’, with two balanced armatures and two dynamic drivers in each earpiece. Using the armatures for higher frequencies and the dynamics for lower ones is the traditional approach with such a set-up. The QT3s definitely sound like multi-driver earphones, but only because you can hear them crunching against each other like unsettled tectonic plates. Driver integration is poor, leading to the sense RevoNext has simply thrown four drivers into these shells, without much consideration for their tonal cohesion. The main characteristic of the QT3s is their raw, untamed treble. The fatiguing acidic intensity becomes the focus of the sound, and it does so without revealing any of the micro detail that can make such bold treble worthwhile. The bass does offer some enjoyment, though. It has good depth and power, and makes a solid, if still ultimately unsuccessful, attempt at balancing out the pronounced highs. Mids sit between, with poor presence and texture, but thankfully no grating harshness. The RevoNext QT3s’ jumble of disparate elements also prevents their chances of displaying convincing rhythmic drive. At first glance, the RevoNext QT3s appear to offer flat-out value. Quad drivers and full aluminium shells seem the stuff of pairs several times the price. Predictably, the results aren’t as impressive as hoped. Poor driver integration and distracting, raw treble characterise the QT3s’ sound and you would get much more consistent results from more expensive, but ultimately less ambitious-seeming pairs, such as the SoundMagic E11Cs and Sennheiser IE 40 Pros.